We have all lived in an era where using internet meant sitting on a computer. Most people would spend endless hours in cyber cafés to browse websites for both work and entertainment purposes. The era of using internet on our personal computers has almost set out. We are all moving towards using devices that offer complete mobility. The new age devices including mobile phones, tablets, iPads and laptops offer better flexibility, especially for people who are always running around places. These devices are helping people all around the world to use internet for shopping, work, entertainment and a lot more while travelling to places. Overlooking the fact that all businesses need a website that is compatible with devices of all types can result in major losses. 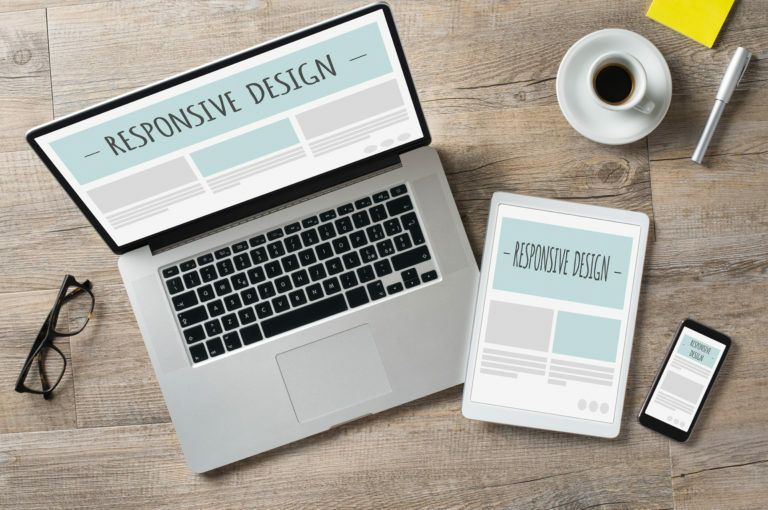 A good website design company will always recommend going with a responsive website that adjusts itself according to the screen of any device. As the name suggest, responsive website designs helps businesses to offer a perfect view of their websites to their visitor on their devices. The website is designed in a way that it responds to the user’s device and adjusts the size of the text and graphics in an appropriate layout. A responsive website will enable you to see a perfect website on your mobile phones, tablets and laptops in an orderly manner. Building a responsive website is not just beneficial in extending excellent user experience but also for improved online presence on popular search engines. It is believed that Google reads and crawls website that are user friendly. Moving towards a responsive website only means that you’re enhancing user experience. In the earlier times, website design and development companies would mostly develop websites that were desktop and mobile friendly. Going with this strategy costed them a bomb because maintaining a website was not only costly but also a tedious task. There are certain principles that you must always follow to come up with a great product. This solution too, involves rules that one must follow to create a website that is perfectly responsive to all devices that you’re visitor may be using. Primary principle of designing a responsive website is to work around changing the dimensions of the content through relative sizing, by means of percentages and CSS. Following the first principle, consequently work on accurately fitting the website pages on any devices that a website may be browsed in. Media queries is a technique that allows developers to match the content of the website on any screen, big or small. The most important feature of a responsive website is to be capable of adapting images as per the size of the screen. Flexible media is the feature that enable websites to appear in different sizes on varied screens. A non-responsive website will not be capable of offering a smooth user experience to your visitor, the content will spread out all across the screen and make it difficult for your user to read any of it. The images will either be too big for the screen and may appear in a pixilated or blurred manner. You may be wondering about the extensive development and time that goes into making a website responsive. Developing a responsive website has been simplified with the help of responsive themes on WordPress. The responsive themes work like magic for people who are looking for quick results on their websites. In addition there are countless options for themes available on WordPress that your website design company can help you integrate to design your website. Some of these features are free of cost while some may be available at a premium price. The themes that are free, will come with limited features. The premium ones on the other hand enable a lot more features than you expected. This version also permits making changes to the built theme, you can ask for a change in the colour pattern, play with the fonts and layout too. Responsive theme is not only a better choice in terms of design of a website but also for daily blogging. You can chose a variety of themes available to display your blogs in multiple layouts. The layouts also work well on all the devices including mobiles phones, tablets, laptops and more. It is always a better idea to hire website design and development company that can make customizations for you and maintain your responsive website as and when needed. Most website design company India are creating website that are responsive, you will barely find the ones that are not. Building a responsive website from scratch is quick, making changes to a website that is not responsive is not. There are certain rules that one must follow to make a website responsive. Ask you developers to assist you with the right tools that are available on the internet to test the responsiveness of your website. These tools will help your website qualify for all features that must be there. We have discussed all the right reasons for building only a responsive website for businesses, irrespective of the nature. Responsive website are the present and future of websites. Hire a Website Design Company India to help you built a responsive website that functions perfectly on all devices.